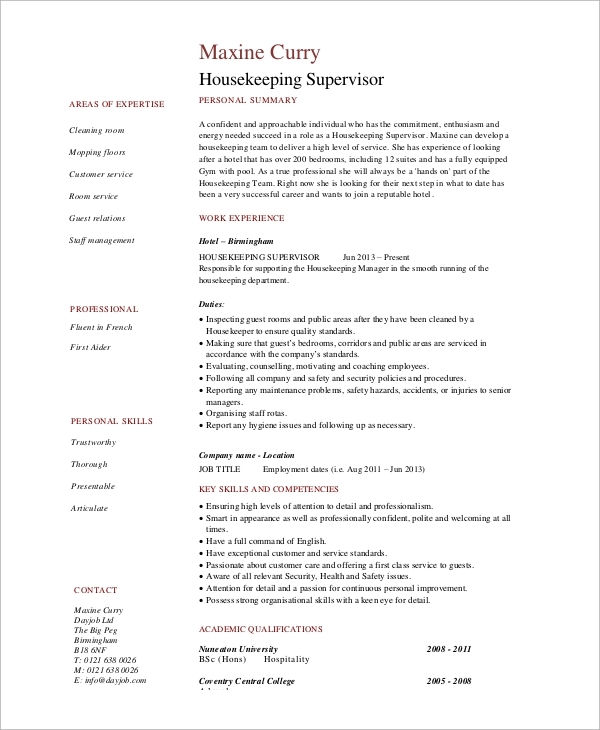 If you are looking out for a housekeeping job, an effective resume is what you need. Housekeeping is a term that defines maintaining and taking care of residential and commercial buildings. The employees applying for the post need to keep the place clean, position different articles in specified placed and maintain the looks of the place. 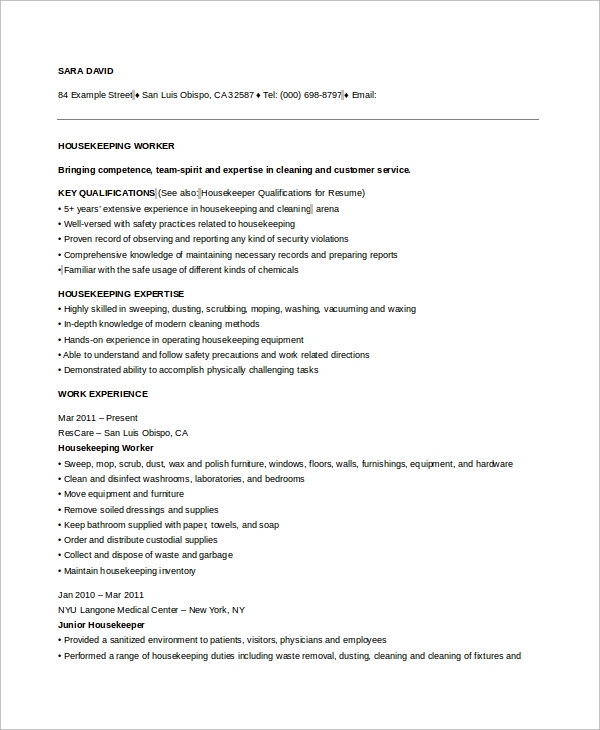 If you need a killing Housekeeping Resume, you can check out these Sample Resumes and get an idea of what you need to craft. For a housekeeping supervisor, it is important to include the personal abilities like cleansing and mopping rooms at the outset. Follow this up with the professional skills and include the contact information in the end. Housekeepers for hotels have a variety of functions to perform. Thus, you need to mention the core abilities like ironing and cleaning at the top of the resume. Include the professional skills and experience later on, in a bulleted format. In this format, the name and address of the candidate are included in the header. 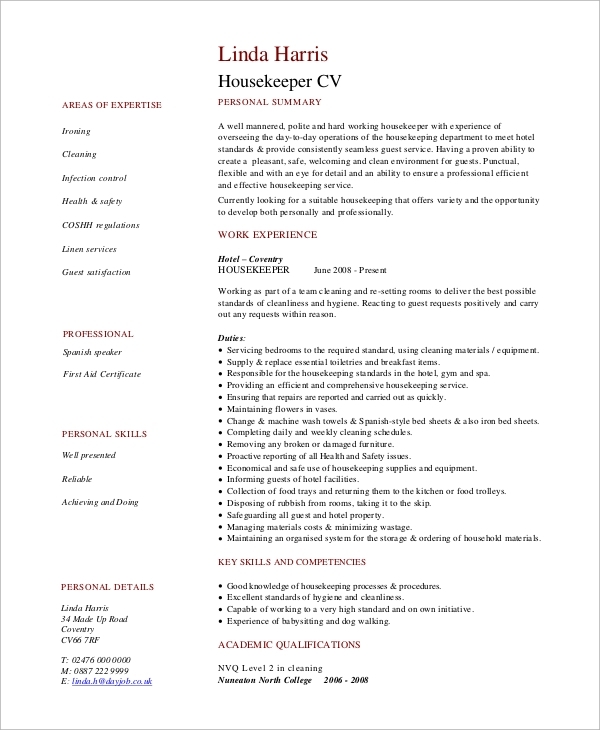 Writer the House Keeping Resume objective in a crisp sentence and move on to the skills, qualifications, and abilities. To develop a resume that will fetch you the right job, you need to craft it like a skilled wordsmith. First of all, make shat you include all your skills and abilities in the resume. These may include administrative and supervising duties as well. You can include a resume objective at the beginning so that the employer gets a clear view of your profile and abilities. Next, you need to be precise about the fields of experience. List up all your abilities in a palatable format. You can use bulleted words for the purpose. However, make sure that the format is presentable and not cluttered up several job titles. You can also see the Federal Resume Samples. The resumes of private housekeeping professionals can start off with the name and contact information. The first paragraph summarizes the abilities and potentialities of the candidate. Then separate heads are used for different areas of expertise. This format has the name and contact information included in the top left area of the document. Then different areas are presented in a graded format or under different subheads. The soft skills like communication and expertise in English are also presented here. 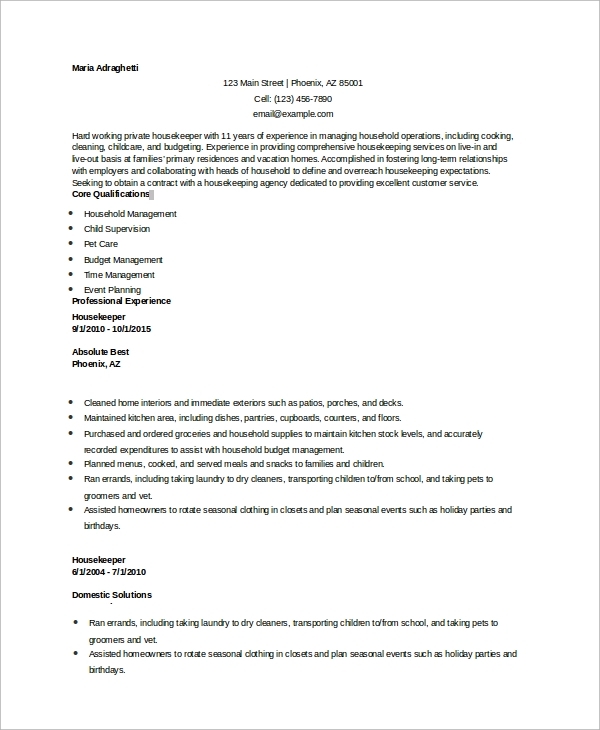 Why Do You Need a Sophisticated Housekeeping Resume? 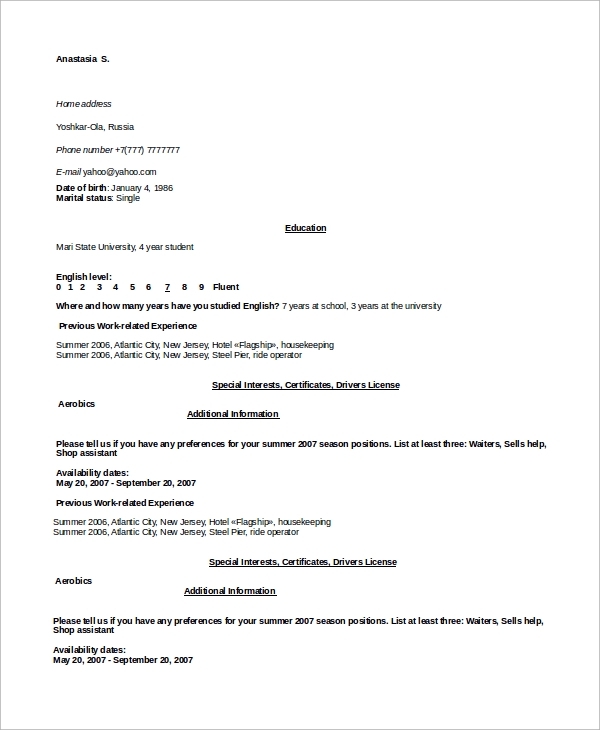 An unbeatable Resume Examples conveys your abilities and skills to the employer. Different companies and individuals have their own requirements on housekeeping. It ‘s hard to get in touch with the right candidate. However, if you tailor your resume as per the profile of the recruiter, customizing your abilities as per the requirement, it becomes easier for you to get employed. When you include words like ‘high levels of energy’ or ‘careful work’ in the resume, the employer finds trust in you, which is so crucial in this profession. 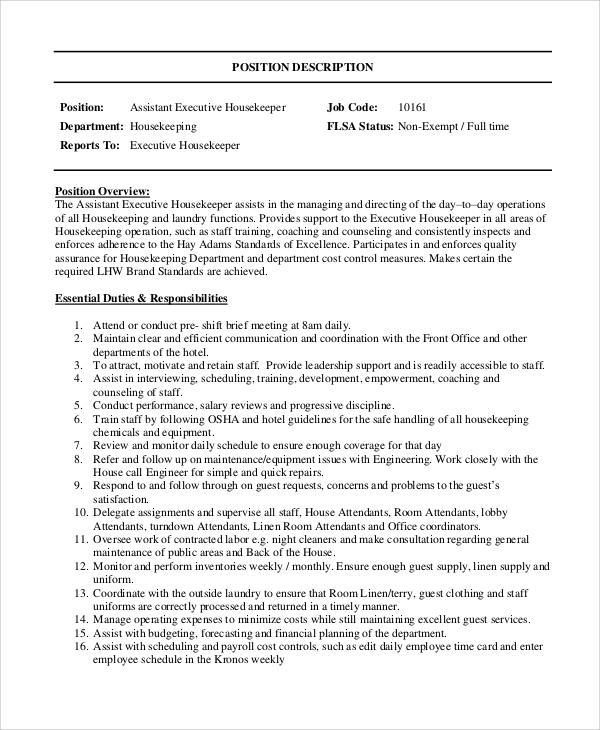 All these reasons justify the relevance of a tailored housekeeping resume. If you apply for the post of a housekeeper, you will find the market saturated. You need to be quite innovative with the resume. 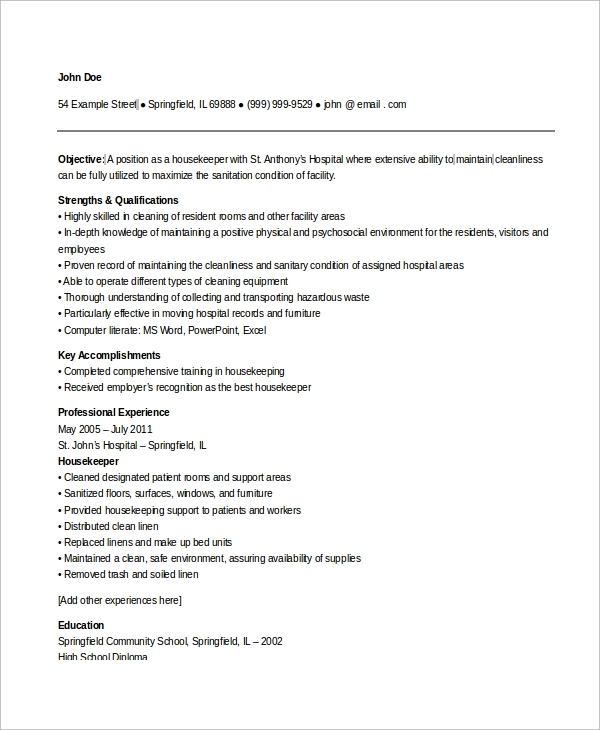 You can look out for different resume examples for housekeepers in the website. This will help you to streamline your Resume Samples and empower your professional life.